Critical ERROR scam is the PUP that uses misleading techniques to prevent removal. Use Reimage to locate malicious components and get rid of them faster than with uninstall instructions. A full system scan blocks virus reappearance and prevents traffic to malicious domains. Red screen critical ERROR virus misleadingly claims that it was triggered by Microsoft. However, it belongs to cybercriminals. 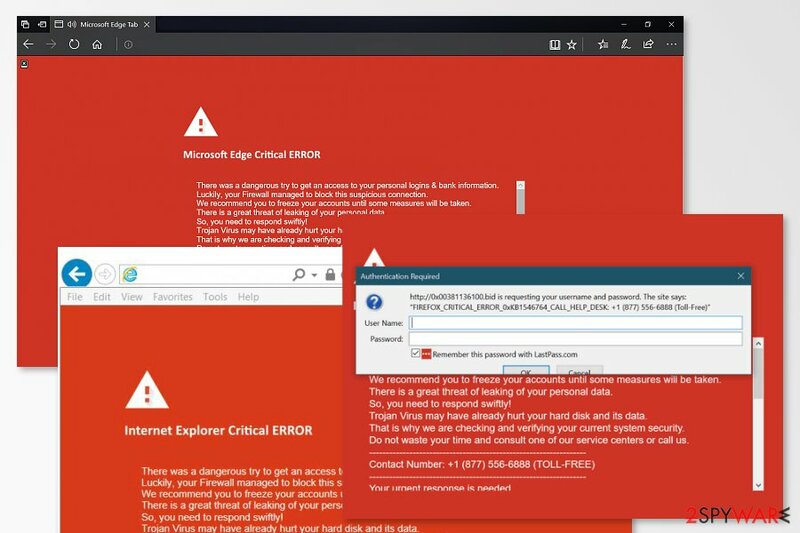 Critical ERROR is a scam which has nothing to do with Microsoft. This red screen message has been used to scare people about invented problems on Google Chrome, Microsoft Edge, Mozilla Firefox, and other web browsers. While trying to mislead users into thinking that their personal information is in danger, scammers display a red screen error which shows up on the screen while they browsing the Internet. Please, do NOT fall for Google Chrome critical error and similar scams because they belong to scammers who will do their best to steal your money, credit card details and other personal information or infect your PC with malware. Internet Explorer Critical ERROR virus. Users might become victims of the Critical ERROR tech support scam while they are browsing on infected or high-risk websites. However, if the browser continuously opens a new tab or window with this site, it’s definitely caused by the potentially unwanted program (PUP), usually adware. download malware, ransomware or spyware into your computer. Scammers are great in human psychology and can use social engineering perfectly. Thus, you may not notice how you follow their demands and give everything they ask for. For this reason, you should not call them even for fun. If redirects continue, you should take all necessary measures to remove Critical ERROR virus from the device. In order to clean the computer quickly and without putting too much effort, you should take advantage of professional anti-malware software. Anti-malware such as Reimage is a perfect choice for Critical ERROR removal. "Critical ERROR" scam might target Google Chrome, Mozilla Firefox, Internet Explorer, and Microsoft Edge users. Mozilla Firefox Critical ERROR. This version of tech support scam is designed to trick Firefox users that their personal data is in danger. The malicious website delivers a fake authentication box that requires entering username and password. However, none of your current credentials will work. It’s a trickery that is supposed to convince you into calling a fake support line. Crooks are known for using +1 (877) 556-6888 and +1 (877) 777-8951 numbers. The message itself might also provide an error code. Currently, it delivers critical system errors 0xKB1546764 and 0xKB6301092. However, none of them are real, and calling provided number is not recommended. Internet Explorer Critical Error. IE users might be tricked that their computers are infected with RDN/Trojan.worm![rand]. In order to protect their passwords, browsing-related information, browsing history, identity and credit card information from being exposed or sold, users have to call +1 888 780 0587. However, this number does not belong to Microsoft Technical Support as the message says. Therefore, the call might be expensive (even if it says it’s toll-free), crooks might actually swindle your sensitive data, money or get access to your computer. 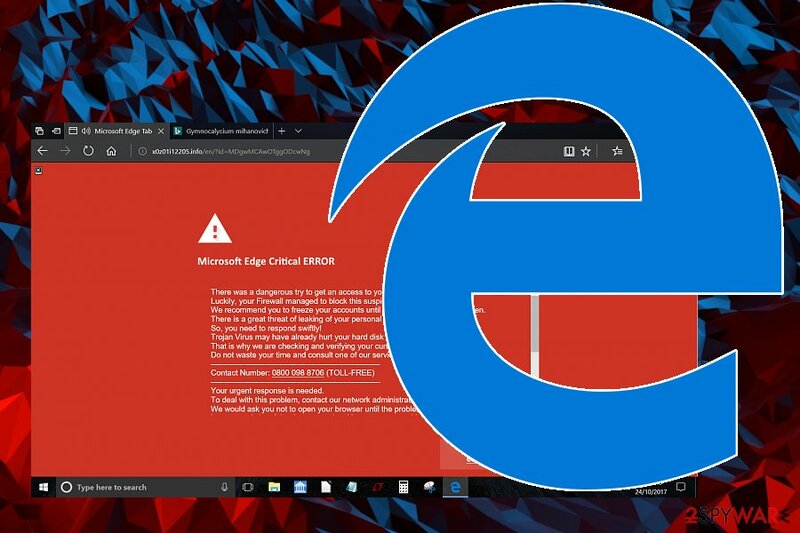 Microsoft Edge critical error virus affects the specific web browser. However, there are numerous versions designed to affect other web browsers. Microsoft Edge Critical ERROR. Cybercriminals pretend to be official Microsoft technicians that report about detected viruses on the computer. This critical system error also asks to call a toll-free number 1-844-734-4622 in order to get needed help to fix the computer. However, Microsoft does not deliver security alerts on Microsoft Edge. Thus, this pop-up is a created by cyber criminals that have hidden purposes, such as selling you a useless security software or getting remote access to your PC and installing malware. Google Chrome Critical Error. Chrome is the most popular web browser, so there's no surprise that Chrome users can receive Critical Error alert too. This version of tech support scam barely differs from the previous ones. Scammers threaten that user's private information might be in danger and they need to call + 1 (888) 562-5234 phone number to get needed help. However, redirects to a malicious website that delivers a fake critical error pop-up are usually triggered by adware. Thus, users are advised to check computer’s security and eliminate the potentially unwanted program to stop this activity. Hence, calling fake “Help Desk” won't help to solve the problem. 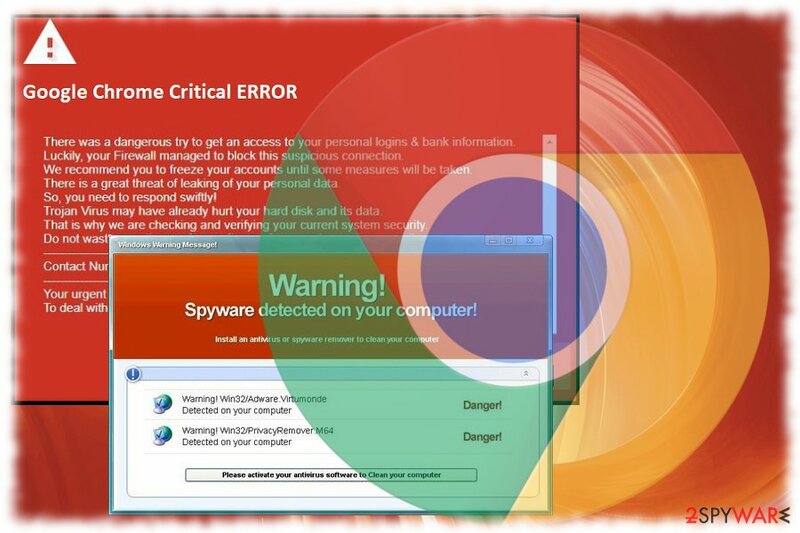 Google Chrome critical error virus is the most popular version of the scam. As you already know, various adware programs might be responsible for redirecting to Critical system ERROR scam website. Infiltration of the PUP might seem mysterious. However, security experts from the UK, Germany, and the U.S. report that there’s no mystery; it’s only a deceptive software marketing method known as bundling. It allows adding the PUP into freeware or shareware package. Therefore, when a user downloads a program, he or she might install it as well. The hijack might be unexpected if you use Standard/Recommended setup because it does not openly disclose about third-party apps. Thus, you should never rely on them. Always install new software under Advanced/Custom settings and opt out all pre-selected applications. Most of them are useless, and you should not test out them. 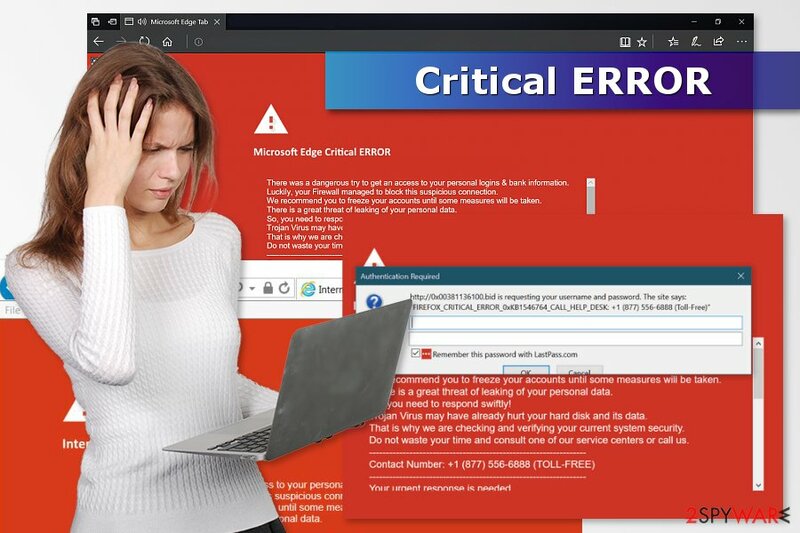 To remove Critical ERROR Red screen virus from Internet Explorer, Microsoft Edge, Mozilla Firefox or Google Chrome might seem like a simple task. However, you will have to find all PUPs, hijackers, and adware, hiding on your system and causing fake ads while you are browsing the web. Typically, such threats infiltrate systems together with legitimate software, so there is no surprise that you can't remember downloading such a virus to your computer. If you want to fasten the entire process, we recommend using anti-malware software. Updated security software can not only take care of Critical ERROR removal. It can also help you identify and terminate all PUPs that are considered to be suspicious. After you finish this procedure, make sure you reset your web browsers to clean them entirely. Here, look for Critical ERROR scam or any other recently installed suspicious programs. To delete Red screen critical error from Mac, you need to find questionable add-ons and extensions on your computer. We also recommend eliminating PC optimization tools as most of them are considered unsafe. Wait until you see Applications folder and look for Critical ERROR scam or any other suspicious programs on it. Now right click on every of such entries and select Move to Trash. When in the new window, check Delete personal settings and select Reset again to complete Critical ERROR scam removal. Once these steps are finished, Critical ERROR scam should be removed from your Microsoft Edge browser. Here, select Critical ERROR scam and other questionable plugins. Click Remove to delete these entries. Now you will see Reset Firefox to its default state message with Reset Firefox button. Click this button for several times and complete Critical ERROR scam removal. Here, select Critical ERROR scam and other malicious plugins and select trash icon to delete these entries. Click Reset to confirm this action and complete Critical ERROR scam removal. Here, select Extensions and look for Critical ERROR scam or other suspicious entries. Click on the Uninstall button to get rid each of them. Now you will see a detailed dialog window filled with reset options. All of those options are usually checked, but you can specify which of them you want to reset. Click the Reset button to complete Critical ERROR scam removal process. ^ The fight against tech support scams. Microsoft blogs.The official Microsoft Blog. ^ Lisa Vaas. Tech support scammer tricked into installing ransomware. Naked Security. Computer security news, opinion, advice and research. ^ DieViren. DieViren. German cyber security news. This entry was posted on 2019-04-01 at 01:51 and is filed under Malware, Viruses. You can quickly scan the QR code with your mobile device and have Critical ERROR scam manual removal instructions right in your pocket. How did you remove Critical ERROR scam?